The Other Boufs: Mommy, Daddy, Katie, Timmy ... and more! : It's beginning to look a lot like Christmas! Thursday night I was awake from 3-5am. 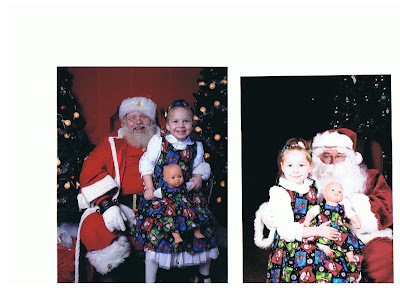 I was stressed about the upcoming day and our appointment to get holiday/birthday portraits at Sears. I hate going by myself with the kids. After many prior stressful experiences, my husband flat out refuses to go with me. At the same time, though, I continue to fork up the money instead of doing portraits at home because I know I can't get them set up and take the pictures on my own. It was as bad as I expected it would be. Timmy broke out with a rash all over his face right after lunch. He had cheese curls and I think that it may have just been from the rough texture getting rubbed into his face. Since of course, they were all over his face. Our appointment was at 4:30pm. We arrived to almost emptiness with only one person ahead of us. She got taken right away and we got to wait until after 5:oopm. How lucky for her! She was so thrilled that she didn't even have an appointment and they fit her right in. She did have an appointment. She had MY appointment! As soon as our "photographer" approached me to say she was ready I knew it was going to be bad. She was the typical holiday time hire, who knows nothing and doesn't try at all. She was teeny, young, and oh so soft spoken. Damn it! I told her to stay behind the camera because I knew Timmy was going to be difficult and she would have to snap quickly. I posed them and then jumped back to try to get his attention. It was not a good game plan. He wouldn't stay still (or even kinda still). He wouldn't look up. He wouldn't smile. I was sweating SO bad. Partially because it was 10,000 degrees. I actually feel like almost every picture session goes this way, but I always do wind up getting a bunch of good pictures. Not this time. I ran out of patience and didn't even get all the backgrounds I wanted. I was so frustrated that the photographer was completely incompetent in even attempting to squeeze a squeaky toy or any other form of attention getting. Katie was getting frustrated that it was taking so long so that even if we did get Timmy to look, she had started to clown around. When I was viewing my pictures I complained. A lot. The very nice and helpful lady offered to reshoot our pictures, but I insisted that there was no way I could go through the process all over again. She said, no we could grab an empty room then and at least shoot one of the other backgrounds. She added that she was known to be the best photographer there. I figured, "Why not?" My kids already hate me and I'm already frustrated to the point of tears. Can't hurt adding to it now. And she WAS good. She had me pose the kids and then stay right by their side to keep Timmy comforted. She did ALL the work of getting him to smile. And she did. She had him CRACKING UP! Unfortunately, I got nothing but cheesy smiles and wide armed poses from Katie at that point. Ugh!!! From there, we went to see Santa while we waited for Chris to join us for dinner. We had already seen him once, but the kids weren't dressed for pictures. I was sure Timmy would burst out crying since he was so tired. But he didn't. He was very interested in Santa and had fun playing with his beard. And although he was so very tired and hungry and sad, we did get him to look at us for a picture. And get another cheesy smile from Katie. 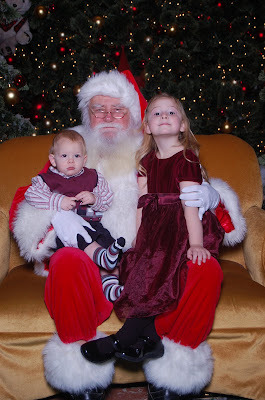 And just to completely illustrate how frustrating kids can be...Katie spent the day with her Grammi yesterday and got to see Santa TWO more times. And guess what, no cheesy smiles for Grammi's pictures! It really is a good thing that I've learned to expect the worst so as not to be surprised. And looking on the bright side, I did get a helluva good work out. Debi is hosting Baby Picture Sunday today at Who Says 8 is Enough? Click on over to see who else is playing along and getting into the Christmas spirit! OH! I am LOVING that first Santa picture with Timmy looking at him! THAT should be your card! It's adorable! That's the way with protraits, one smiling and the other sulking. I love the photo of Timmy looking at Santa. 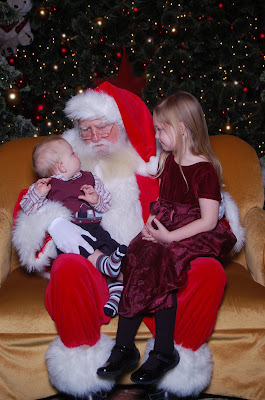 I have one of my son, age 9 months, grinning widely with both hands holding fistfuls of Santa's beard. The next Christmas he was terrified of Santa! Looks pretty now! I really LOVE the header and the photos in it are adorable!